Give stuff, get stuff. Donate to charity. Take a picture of the thing you want to give away. People can request it as soon as it's up on Better Finds, and once you approve their request, their contribution will go to the charity of your choice. You can browse Better Finds to find good stuff. When you find something you want, simply press the button to donate a small amount to charity, and pick up your item afterwards. With Better Finds, you pay for things by donating to charity. You get stuff you want, and you do good while doing it. It's a win-win. You don't need to throw away your good, old items anymore. With Better Finds, you can easily give them away. The people receiving them will donate a small amount of money to a charity of your choice. 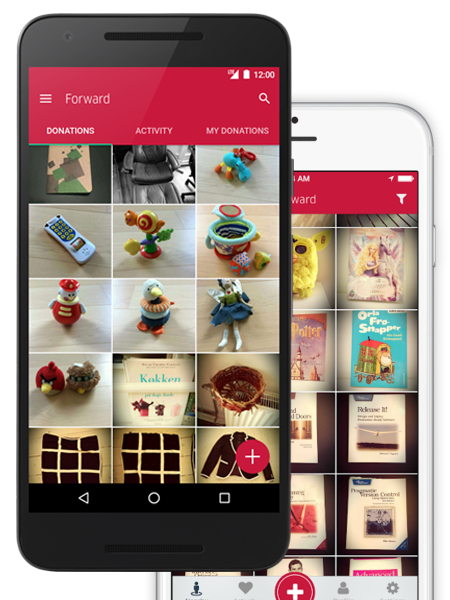 To get started, all you have to do is take a picture of the item you would like to give away, put a price on it, and pick a charity from the list. You can get rid of your stuff, people get things in good condition that are almost free, and charity organizations get extra help. Everybody wins! You can donate anything you own, but make sure to only donate stuff that can be useful to others. There's no reason to donate broken things if it would be very hard or expensive to fix them. Where do I pick up items? This is something you agree with the donor of the item. It's up to you to contact the donor once your request has been approved, so you can figure out where to pick it up. Payment is handled inside the app. The first time you request a donation, Better Finds will ask for your credit card information. Once your request is approved, your card is automatically charged. No payment is needed when you pick up your item. Our list of charities is based on geographical location. If your favorite organisation isn't listed, tell them to get in touch with us so we can set them up.